Come along with Ansel, Clair and their spaceship Marley on their latest adventure. Ansel is an intergalactic travel photographer from the planet Virtoos. On this adventure they travel back in time to meet Paul Revere and other important people from the American Revolutionary War. As they travel, Ansel and Clair share the many interesting facts they learn as they become immersed into this very important time in history. 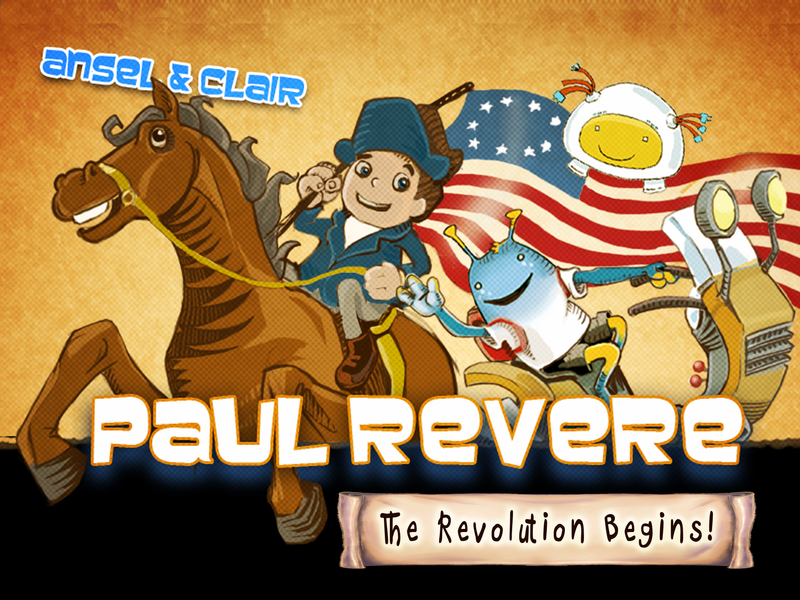 Paul Revere’s Ride is another fabulous Ansel & Clair adventure. Enjoy learning about the American Revolution in this interactive and educational app. This excellent app is loaded with features and content. It is very well designed for kids ages 5 to 12. Paul Revere’s Ride is a hands-on app requiring the user to interact by navigating through the app, playing mini games, taking pop-up quizzes, and performing other activities such as taking pictures for the travel log and maintaining the log. Beginning readers may need assistance reading the text throughout the app. Up to four user profiles can be created and are easy to maintain from within the app. Thorough in-app help, instructions and tutorial are optional, but very useful. The buttons and features are explained in enough detail to get you quickly on your way. Multiple navigation features have been built into the app, features such as the Table of Contents, information and content icons, and scene navigation buttons. The Table of Contents allows the user to quickly return to completed areas. It also acts as a progress tracker which allows you to see at a glance which sections have been completed. Information and content icons contain buttons for returning to the main page, settings, help, table of contents and more. These icons are available throughout the app. Scene navigation buttons include a guiding hand icon, stop/replay, clairvision, left/right arrows to name a few. Paul Revere’s Ride is an excellent method for teaching American History to young kids. It presents the American Revolutionary War in a way that kids are more likely to remember what they have learned. Facts are presented through multiple activities and then reinforced by the pop-up quizzes. Features that extend the learning opportunities into fun activities are the locator map, travel log, special in-app camera, and Ansel’s backpack. A Locator Map can be used to view key locations on a current map; an internet connection is required and the map can be viewed in satellite or map mode. VirtooCAM is the special in-app camera used to take pictures for the travel log. The Travel Log contains the pictures you have taken during the course of your travels. The ability to add your own notes gives the user ownership of their pictures. Pages can be shared with family and friends by e-mail. Ansel’s backpack is where the locator map, travel log and camera are kept. Due to plenty of hands-on activities and required interactivity, this educational app will also entertain. Some of the mini games included are the 13 colonies puzzle, no taxation without representation, Boston Tea Party and help Samuel Prescott escape. This is just a small sampling of what you can expect in the mini games. In the 13 colonies puzzle the user needs to correctly place the original 13 colonies which is easy to do as the colonies snap into place when they get close their required location. No Taxation without Representation has the user drag money bags from the colonists to King George. King George becomes happier the more money you give him, the colonists more angry. The Boston Tea Party is similar to the previous game, but has you move boxes of tea into whale’s mouth. In the Photo Booth tap each person to take their picture and learn their role in the American Revolution. Whether your child is currently learning about the American Revolutionary War or you are looking for an educational app with games, this app serves both objectives well. The app can be replayed numerous times. Easy to navigate, enjoyable to use, Paul Revere’s Ride will appeal to a wide age range of users. The younger users may need assistance reading the text. Except for the more apps link on the main screen this app is child-safe. Social media and other links are on the information menu. Ideally, the more apps link would be removed from the main screen. This app does not contain in-app purchases or ads.